Coluber buccatus Linnaeus 1754; 1758: 217. Holotype: Lost, (Andersson 1899.). Type locality: "Indiis." In accordance with Article 75.3 of the ICZN, FMNH 250114 is established as the neotype for Coluber buccatus Linnaeus, 1758. The selection is based upon the type locality “Indiis” which we interpret to mean the East Indies, now the Indonesian Archipelago. See discussion below.With the selection of the neotype the type locality is restricted to Singapore. This specimen was selected because it comes from a location near the east-west center of the range, its collector and locality are known, and tissue from it is available. Coluber monilis Linnaeus 1758: 221. Type locality: "America," in error. Synonymized by Schlegel (1837:337). Andersson 1898: 34. Vipera buccata Daudin 1803a, 6: 220. Coluber horridus Daudin 1803b, 7: 71. Type locality: “Amerique, selon Seba,” in error. Homalopsis monilis – Boie 1826: 521. Homalopsis buccata – Schlegel 1837: 2, pl. 13, figs. 1-5; Cantor 1847:96; Gray 1849:67; Bleeker 1857:238; Günther 1864:285; Blanford 881:215; Boulenger 1890:374; Müller 1887:267; Mocquard 1892:193; Boulenger 1896: 14; Boettger 1898, 2:88; Flower 1896: 887; 1899: 677; Ridley 1899: 208; Lampe & Lindholm 1902:31; Boulenger 1905: 175; Barbour 1912: 123; Boulenger 1912: 162; Despax 1912: 199; Werner 1896: 19; 1900: 490; Laidlaw 1901: 578; Wall 1903: 94; Rooji 1917: 186; Robinson & Kloss 1920: 303; Sworder 1923: 66; Wall 1924: 867; 1925: 817; Dammerman 1926: 323; Brongersma 1929: 67; Dunn 1927: 4; Kopstein 1930: 136; 1938: 160; Smith 1930: 61; Brongersma 1931: 35; Kopstein 1941: 138; Haas 1950: 577; Bergman 1951: 511; Lim Boo Liat 1955: 125; 1956: 142; Hoesel 1959: 74; Bergman 1962: 291; Gyi 1970: 136; Tweedie 1983: 103; Steubing 1991: 333; Berry & Lim 1967: 307; Bosch 1985: 18; David & Vogel 1996: 119; Manthey & Grossman 1997: 356; Steubing & Inger 1999: 96; Teo et al. 1997: 253; de Lang & Vogel 2005: 253; Auliya 2006: 222; Murphy 2007: 193. Comment. The only clues to the identity of Coluber buccatus Linnaeus are the ventral and subcaudal counts, and the type locality. The ventral count of 107 is an error, possibly for 170 or 167, in either case two numbers that are completely speculative on our part. The subcaudal count of 72 lies outside the range of all male Homalopsis examined here, but within the range of all female Homalopsis for which we have data (Table 1), except the new Indochinese species (females have 73–92 subcaudals). However, 72 subcaudals is toward the middle of the range for the taxon that inhabits the Indonesian Archipelago. The Indonesian species occupies the largest portion of the Homalopsis distribution, making it statistically probable that Coluber buccatus Linnaeus originated from this population. Oldfield Thomas (1911) noted that “Indiis” as a type locality can only be interpreted to mean “foreign;” and it has been interpreted as being India (Yen 2004) as well as South America (Presch 1973). Here we are interpreting Linnaeus’ locality of “Indiis” for Coluber buccatus as the East Indies, given current knowledge of the distribution of the genus Homalopsis. The gender of Homalopsis is feminine. Coluber monilis Linnaeus 1758:221 was represented by four syntypes one of which closely agrees with Linnaeus’ description (Andersson 1899). NRM 63 (presumably the specimen noted by Andersson) has scale counts (confirmed by Sven Kullander, NRM) consistent with Homalopsis buccata. The specimen is a 245 mm juvenile male with two prefrontal scales; 39 scale rows at midbody reduced to 29 rows at the 10th ventral anterior to the cloaca; 163 ventrals; 83 subcaudals. Coluber subalbidus Gmelin, (1789:1103) is based on a drawing in Seba (1735: pl. 21, fig. 3) of a snake said to have 165 ventrals, 75 subcaudals, and 40 dorsal scale rows. The type locality was given as America. 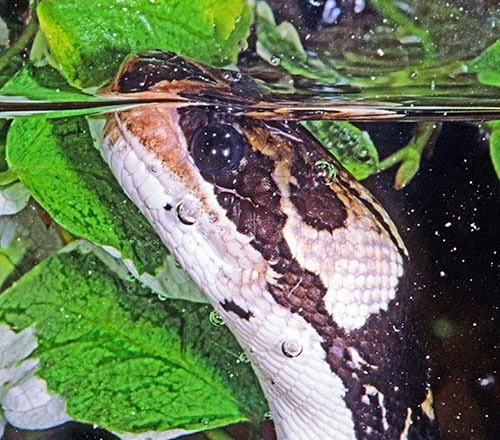 Schlegel (1837: 337) placed this snake in the synonymy of Homalopsis buccata. Accepting the scale counts as given, this snake could be H. semizonata, H. buccata, or the new species described here. Thus we have removed this name from the synonymy of H. buccata because it is nomen dubia. Coluber horridus Daudin (1803b) was based on a specimen with 166 ventrals and 87 subcaudals. The type locality was in error, and Schlegel (1837) placed the name in the synonymy of C. buccatus Linnaeus. Given the scale counts and the absence of other information, we follow Schlegel. Again, this name could be applicable to any one of three species given the data available. Because this is the type species for the genus, it has been retained in the synonymy of Homalopsis buccata. Photographs of Homalopsis buccata can be found in: Auliya (2006: 195), Chan-ard et al. (1999: 169), Lim & Lim (1992: 77), and Taylor (1965: 920–921). Field and laboratory studies and observations that relate directly to this species include reports by Auliya (2006), Bergman (1951), Berry & Lim (1967), Kopstein (1930, 1938, 1941), and Lim Boo Liat (1955, 1956, 1965). Distribution. Homalopsis buccata ranges from northern Sumatra to Salanga Island, Indonesia and Borneo; it is present on the Malaysian peninsula and in extreme southern Thailand (vicinity of Pattani). There is a single specimen reported from Sulawesi, but its presence there has not been confirmed (Rooji 1917; Gyi 1970; Murphy 2007; De Lang & Vogel 2005). posteriorly; one postocular and one postsubocular. 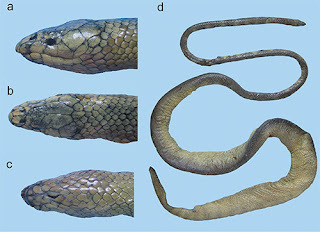 The new species, H. mereljcoxi, has a single loreal contacting upper labials 1–4; 40–47 scale rows at midbody, reduced to 30 or more posteriorly; two postocular scales plus a postsubocular; and ventral counts that are usually greater than 165.
divided; ventrals number 74. Dorsal scale rows 39–37–27, scales are keeled and striated. On the head the snout and anterior crown are dark brown with a posterior occipital pale patch. Upper labials are shaded dark to pale from dorsal to ventral; each side of the head has a dark eye stripe that extends from just before the eye to the buccal "cheeks"; there are 25 light colored bands on the body, 2–3 scales wide, outlined in black and separated by 26 dark brown bands that are 5–7 scale rows wide. The ventral surface is a uniform yellow with 53 pairs of dark brown spots, one on the outer edge of each ventral; the ventral surface of the tail is mottled black and cream. Variation. The internasal can be single or divided; the loreal is always single in our sample. Scales in the ocular ring number 5 or more (1 supraocular, 1 preocular, 1 presubocular, 1 or 2 postoculars, 1 postsubocular, 0–2 suboculars, and rarely upper labial 5 or 6). Upper labials are usually 12 (11–14), the first 4 usually contact the loreal (rarely 2–4), the first divided upper labial is usually 7; lower labials range from 15–19, 16 or 17 are usual; the first 3 or 4 contact the first pair of chin shields. Variation in scale counts: (n = 16 males): Dorsal scale rows at the 10th ventral 36–40 (x̄ = 37.2, SD = 6.11); scale rows at midbody 33–39 (x̄ = 36.43, SD = 1.82), scale rows at post body 26–29 (x̄ = 27.06, SD = 1.06). Ventrals 159–168 (x̄ = 163, SD = 2.55). Subcaudals 78-87 (x̄ = 83, SD = 2.43). Variation in females (n = 21 unless otherwise noted): dorsal scale rows on neck 37–42 (x̄ = 38.57, SD = 1.09), scale rows at midbody 33–40 (x̄ = 37.52, SD = 1.40), scale rows at post body 25–30, (x̄ = 27.33, SD = 1.37); ventrals 151–166 (x̄ = 160.19, SD = 3.29); subcaudals 65–80 (n = 18, x̄ = 74.28, SD = 1.09). Kopstein (1941) reported scale counts for 34 specimens of Homalopsis buccata from four locations on the island of Java (Soetardjo, Grabag, Indramayu, and Bogor). His ranges are very similar to ours; the slight differences in ventral counts may be explained by our use of Dowling’s (1951) ventral scale counting method. Our analysis of Kopstein’s data revealed the following: dorsal scales at midbody 35–41; ventrals 158–170 (males: n = 20, x= 166.55, SD = 1.87; females: n = 14, x̄ = 163.5, SD = 2.692); subcaudals in males 71-86 (n = 17 x̄ = 83.11, SD =2.61), and subcaudals in females 70–84 (n = 11, x̄ = 74, SD = 4.44). Size. Sixteen male SVL's ranged from 167–695 mm (x̄ = 479.7, SD = 201.6), and their tails ranged from 56–236 mm (x̄ = 150, SD = 58.9). Twenty female SVL’s ranged from 192–794 mm (x̄ = 511, SD = 157.08); 15 undamaged tails were 62–202 mm (x̄ = 148, SD = 42.59). The SDI is -1.06 for this species. The largest specimen of H. buccata reported in the literature is a 1228 mm female from Bogor (Kopstein 1941). Material examined. INDONESIA: Java, Buitenzorg MCZ 76252-59; Salatiga CAS 145591, FMNH 105682; Sumatra, Little Siak River USNM 37813, no specific locality 55325-330; MALAYSIA: Johore ZRC 2-3346 (Bukit Timah), 2-3348, Perak CAS 13066 (42 mi. N. of Kota Tinggi, Johore, Malay Peninsula), FMNH 161283 (Ampang), 183771 (Kampong Eleng 13 mi N Semengih); FMNH 218877, 229810, 229813–17, 229820 (Johore, Muar), FMNH 229823 (Johore, Bukit Gambir); SINGAPORE: CAS 8538-39 (no specific locality), FMNH 250114 (Nee Soon Swamp Forest), ZRC-2-3338-39 (no specific locality); THAILAND: Pattani FMNH179316–18.